One of Ireland's leading schools for dance, drama, arts & theatre. Stage Academy is a multi-award winning stage school based in Newbridge, County Kildare. 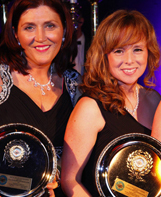 The academy was established in 2006 by Brenda Malone and Paula Conlan who both have exceptional experience in drama and dance. Offering a range of classes throughout the year and catering for pupils from the age of 4, Stage Academy provides lessons where all learning is age-appropriate. Stage Academy is known for its friendly family atmosphere and creates the perfect environment to build a student’s confidence and self-esteem. Please see our pages for more information about all that Stage Academy has to offer. Registration for Summer Camp now open!! We are thrilled to announce that registration for our 2019 Summer Camp is now open! The camp will run Monday to Friday from 1st to 12th of July in Scoil na Naomh Uilig, Newbridge. Places are limited so book early to avoid disappointment!